The analysis of the sports with high tactical component is important for the coach elaborates the training and orients the athlete. The study about tactical analysis of the competition zone is interesting for the coach knows the attack and the defense of a sport, this permits better prepare the strategy and the tactical for the athlete during the competition. Shotokan karate during the kumite (fight) competition occurs in a zone of 8x8 meters (m) with a time of fight of 1 minute and 30 seconds to 2 minutes. The literature of the shotokan karate detected that in the fight of competition the points are results of punches and kicks (ippon or waza-ari). The punches of the kumite with higher index score are the gyaku zuki, the kizami zuki and the oi zuki. The kicks with more points in karate fight are the mae geri and the mawashi geri. The objective of the study was to determine the fight zone with point during the male kumite of competition. 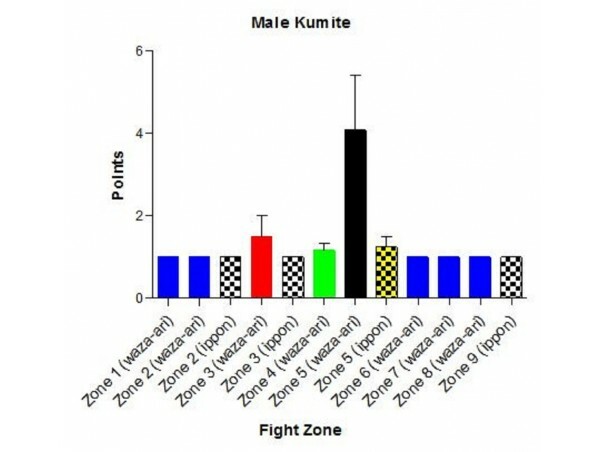 This study used a quantitative research for identify the fight zone with point (ippon or waza-ari) or not during the male kumite of competition. 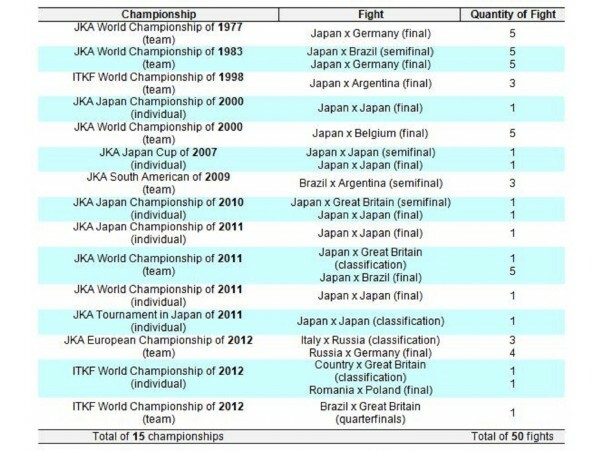 Several championships of kumite of the JKA (Japan Karate Association) and of the ITKF (International Traditional Karate Federation) were selected in the Internet. The data were collected by researcher of the Compaq® notebook, model Presario CQ43-325BR. In notebook, the researcher used a scout adapted from Oslin, Mitchell and Griffin to annotate in the fight zone of the attack with point (waza-ari or ippon) or not. Results are expressed as means ± standard deviations of the championship, percentage and total. The normality of data was assessed by the Shapiro Wilk test (p≤0,05). 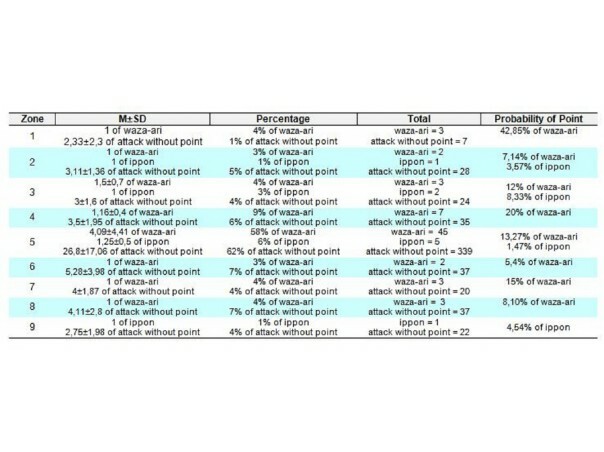 In case of data normal, the difference between the fight zones with points of the championship kumite were analyzed using an One-Way ANOVA with results accepted a level of significance of p≤0,05. Where a significant difference was found, a Scheffe post hoc test was used with results accepted a level of significance of p≤0,05. When the results have significant difference the research calculated the effect size (ES) in accordance with Dancey and Reidy (ES = [Mean – Mean]: Mean of the Standard Deviation) to the following classification: equal or greater than 0,8 is great, 0,5 to 0,7 is medium and 0,4 or less is small. In case of data not normal, the difference between the fight zones with points of the championship kumite was analyzed using a Kruskal-Wallis ANOVA H test with results accepted a level of significance of p≤0,05. Where a significant difference was found, the Mann-Whitney U test was used as post hoc with results accepted a level of significance of p≤0,05. When the results have significant difference the research calculated the ES in accordance with Dancey and Reidy (ES = [Mean – Mean]: Mean of the Standard Deviation) to the following classification: equal or greater than 0,8 is great, 0,5 to 0,7 is medium and 0,4 or less is small. Some data (Shapiro Wilk test, means ± standard deviations, One-Way ANOVA and Scheffe post hoc or Kruskal-Wallis ANOVA H test and Mann-Whitney U test) were calculated according to the procedures of the GraphPad Prism, version 5.0. Based in Weinberg and Goldberg, was calculated the probability of points in the fight zone of the shotokan karate male competition with the following equation: Probability of Point = [number of points (ippon or waza-ari) in the fight zone: total of attack in the fight zone] . 100 = ?%. The reliability of the observation determined a percentage of agreements of 100% for waza-ari and for the ippon. The total of attack without point was of 544, the agreements of the attack without point was of 509, the disagreements of the attack without point was of 35 and the percentage of agreements was of 93,56%. Shapiro Wilk test determined data not normal. Kruskal-Wallis ANOVA verified significant difference between the fight zone with points, H (11) = 27,5 p = 0,003. The Mann Whitney U test detected significant difference between the zone 5 with waza-ari versus all the zone, the results were the as follows: zone 5 with waza-ari x zone 3 with waza-ari, U = 3, p = 0,03, effect size = 1,01 great; zone 5 with waza-ari x zone 4 with waza-ari, U = 5, p = 0,004, effect size = 1,22 great; zone 5 with waza-ari x zone 5 with ippon, U = 4, p = 0,01, effect size = 1,15 great and zone 5 with waza-ari x others zones (zone 1 with waza-ari, zone 2 with waza-ari, zone 2 with ippon, zone 3 with ippon, zone 6 with waza-ari, zone 7 with waza-ari, zone 8 with waza-ari and zone 9 with ippon), U = 1,5, p = 0,01, effect size = 1,4 great. Zone 5 with waza-ari was the fight zone with more points during the male kumite (4,09 ± 4,41 of waza-ari). The karate fight has a short duration and the zone 5 is the area where the fight starts, therefore this is a cause of more points in zone 5. In the lateral zone, precisely the zone 1 was the region with more probability of points that this study found, 42,85% of waza-ari. The zone 1 has 1x1 m, a small space for karateka defend the opponent`s attack or practices other action of defense, for example, anticipate the opponent`s attack. In all lateral zones the karateka had the probability of 0,12% of practices a point. But the central zone (zone 5), during the combat, the karateka had the probability of 14,74% of practices a point. 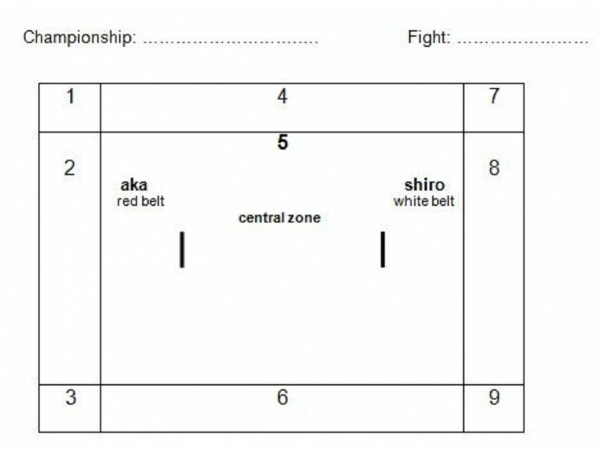 The zone 5 was the fight zone with more points during the kumite because the shotokan karate has a fight of short duration, is the zone where the fight starts and is a greater fight zone. However, more studies should be done to confirm these findings.